Al-Laam Al-Qamareeyah: or “the Moon Laam” is the laam saakinah (sukoon on the laam) which must be pronounced clearly. 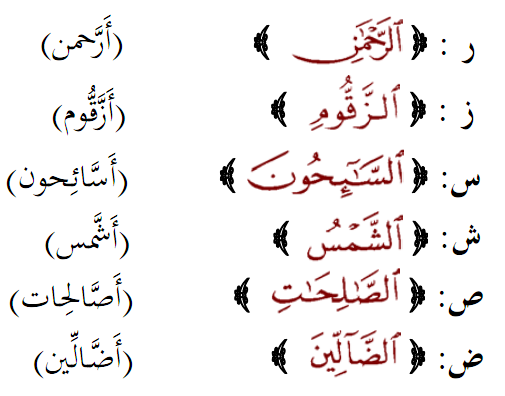 This laam occurs at the beginning of the word (Al- ..) and occurs in nouns. Pronouncing it clearly happens with the remaining 14 letters that aren’t covered in the laam shamseeyah. 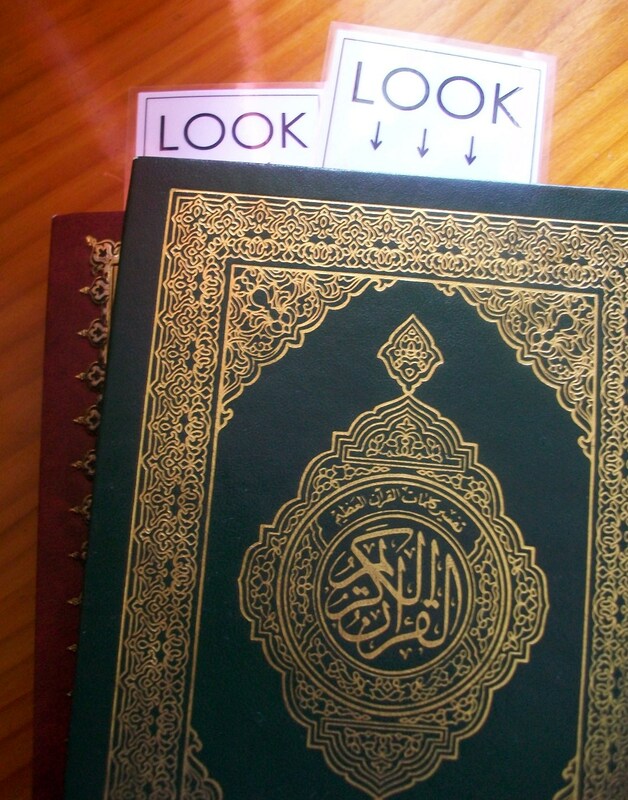 You will notice in Quranic scripture a little haa looking shape (حـ) above the laam. This is just to act as a reminder for reciters: to make sure that you remember to say Al-… and not merge the laam into the next letter. Note: just because there is a letter before, this does not change the ruling for the laam. Here’s a challenge: can you guess why none of the “Al-” nouns have tanween on the end? Don’t cheat. But if you can’t figure it out, read the answer on page 61 of Gateway To Arabic. Did you find this at the UQ Musallah recently? If you’re here to check out the site, or check your answer, then Asalamu alaykum! Remember to subscribe to this site (subscription option found in the right hand menu). And leave a comment remarking how you went with your bookmark’s tajweed question! Click on the bookmark you received to reveal the answer! There you have it! Remember to sign up, and check out the post that relates to your bookmark! Do you favour sunny days over cool nights? Or a bright glowing moon instead? This post is filled with sunshine, so pop on your sunnies and get ready… you’ll now be officially introduced to our star (pun intended)…..Sunny Laam! …no: not Lamb! There is a big contradiction between the way I type transliteration, and this post. You will come to realise this as I begin to explain this rule. Al-Laam Al-Shamseeyah: is the laam which occurs at the beginning of a word, whereby it is merged with the letter that follows it. a) In the case where the laam is merged, the “ll” sound it makes is completely eliminated. b) For the laam to be merged, it must be a silent laam. c) Considering no word in the Arabic language can start with a sukoon, the merging of the laam cannot happen unless the word begins with “Al-“. This is because – had there been no alif before the laam – there would be nothing to “make possible” the merging of the “ll” sound. e) You will notice, part of the Quranic scripture, that there is a shaddah on the letter that invokes this merging. f) For the laam to be merged, it cannot be part of the original make up of the word. 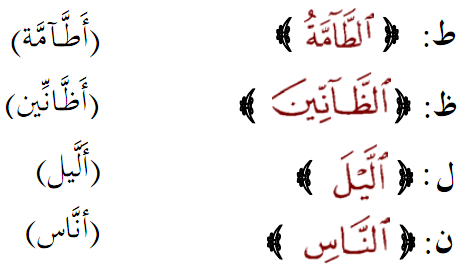 On the right is the letter example and the Quranic script, on the left is how it is read. Note that merging the laam into the next letter cannot happen unless you sound a shaddah on that letter, i.e. for the last word in the examples, you must say, “annaasi” not “anasi”. If a shaddah is not sounded, the meaning can change entirely. That’s all for this sunny post! Just remember, sunny laam = merging = no laam at all = shaddah. 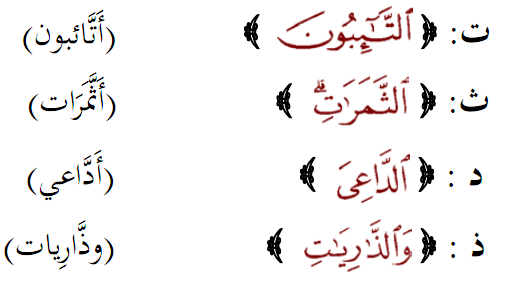 Beautiful examples and practice on page 62 of the Gateway To Arabic resource file. Link to resource page is found below.